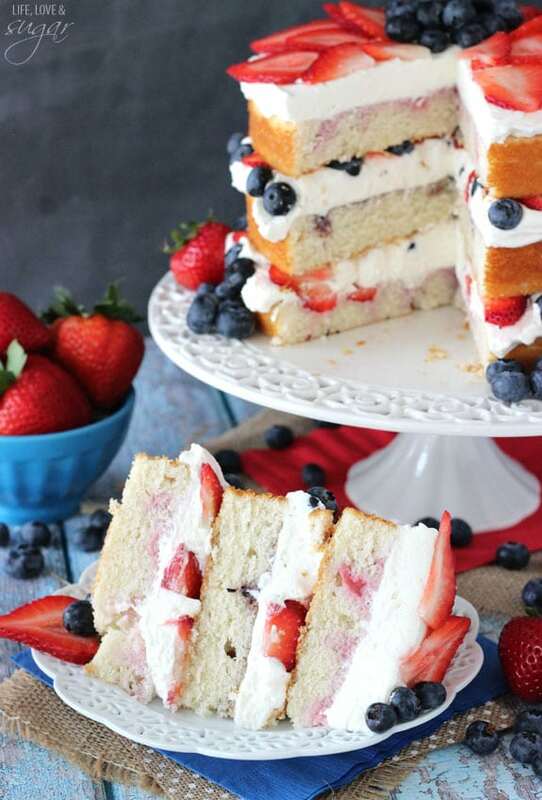 This Fresh Berry Vanilla Layered Cake is light, fruity and the perfect dessert for sharing! It’s also easy to make and with the red and blue, it’s prefect for the Fourth of July! This post is sponsored by Driscoll’s Berries, but all opinions are my own. Summer is one of my favorite times of year. There are fresh berries galore and they’re all on sale! I love getting them not only for snacking, but for desserts. Berry-filled desserts are easily some of the hubs and I’s favorites. And I always know that Driscoll’s is a great brand of berries that I can trust to be delicious! So of course I was excited to join them in sharing Driscoll’s Food Art and creating the picture perfect plate. I’ve mentioned before how fruit is nature’s art and that could not be truer than with berries. There are so many fun ways to use them to decorate food. Such a great thing to do with kids too. In the case of this cake, I used strawberries and blueberries and made a big beautiful berry flower on top of the berry-filled cake. I was totally in love with the look of it. So bright, beautiful and summery. One of my favorite looks for a cake is the naked look. I love being able to see the pretty layers and being naked, it’s even easier to put together, since you don’t have to worry about icing it. 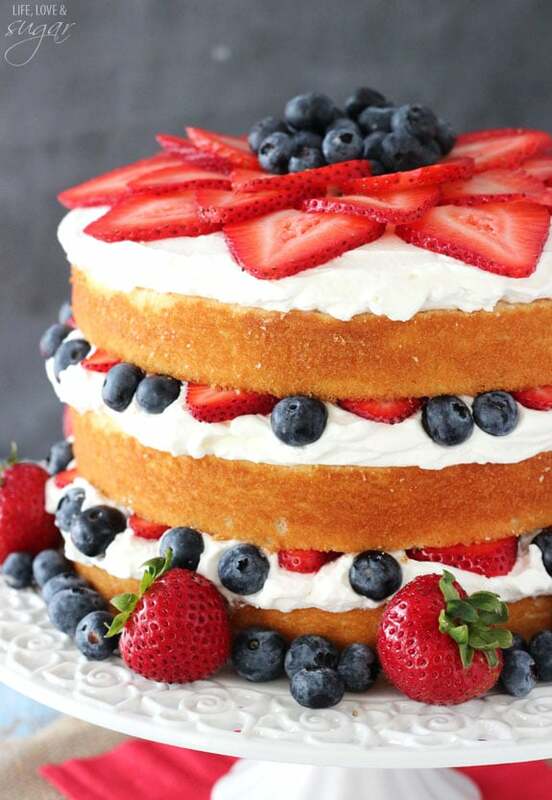 For the layers of this cake, we’ve got a light vanilla cake, whipped cream and fresh Driscoll’s berries. And to take it up a notch, holes are poked into the cake layers and then strawberry and blueberry puree is poured over them. 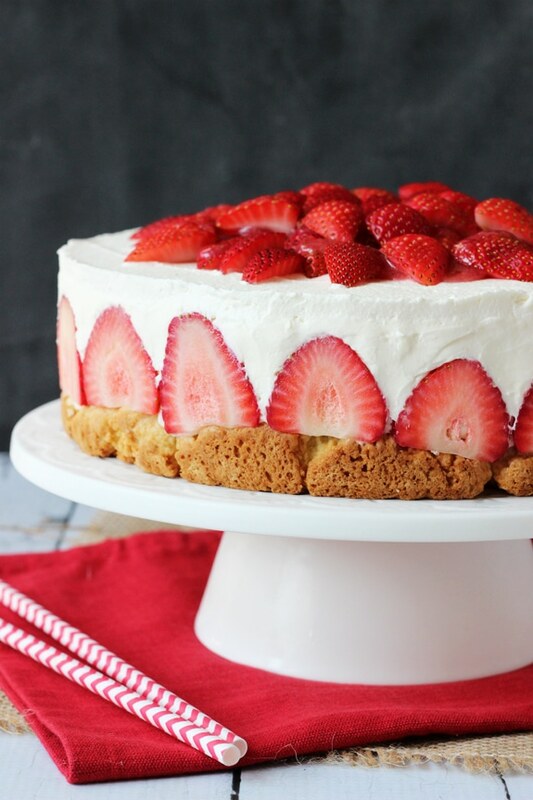 It adds even more berry flavor to every bite and makes the cake layers extra moist! Plus, it adds some extra color to the inside of the cake when you cut into it. And don’t be intimidated by the big fruit flower on top. That’s probably the easiest way you could decorate a cake. 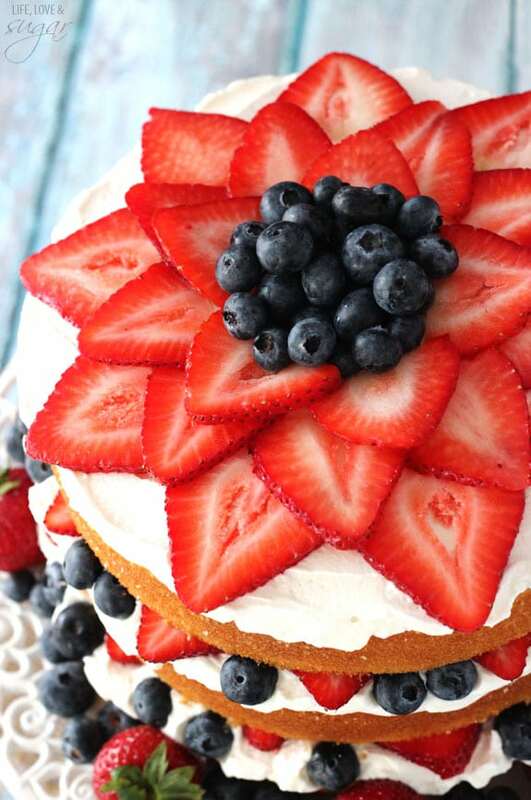 Strawberries are sliced and placed around the outside of the cake in three rows, then the center of the flower is filled in with blueberries. The effect is striking, don’t you think? 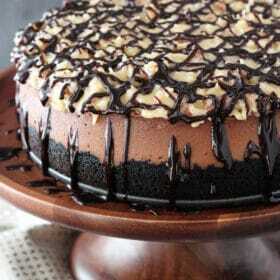 This is a great cake for sharing with a group of friends. It makes a statement of it’s own and it’s a light treat that’s perfect for the warm weather. 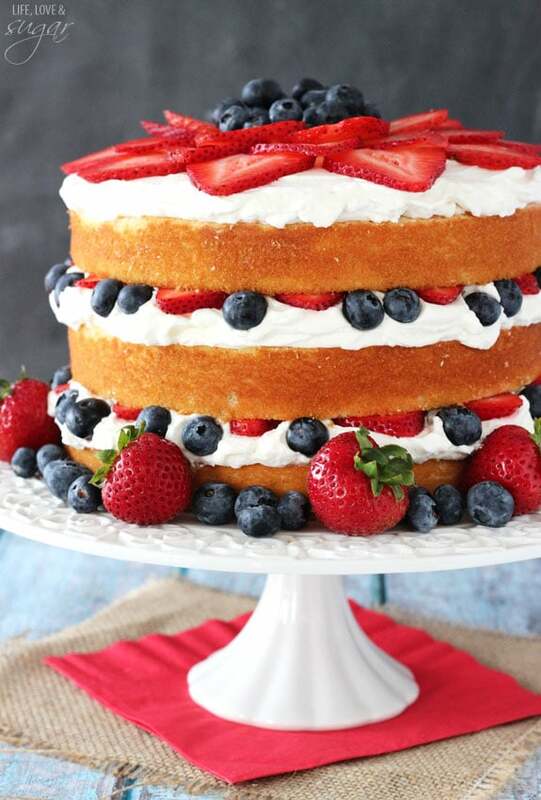 My parents have friends over every July 4th for dessert and if you’re anything like them, I know this cake could be the perfect dessert to share. Also, if you are looking for other fun berry desserts, you can check out Driscoll’s recipe page. And if you have a love of berry fruit art, be sure to enter the Driscoll’s sweepstakes. Just create your own treat, upload a photo and tag it to win. 1. Preheat oven to 350 degrees. Prepare three 8 inch cake pans by placing parchment paper circles in the bottom of the pans and greasing the sides. 2. Cream butter and sugar together until light in color and fluffy, about 3 minutes. 4. Add egg whites in two batches, beating until well combined after each addition. 5. Combine flour and baking powder in another bowl. 6. Alternating adding dry ingredients and milk to batter, beginning and ending with the dry ingredients. Beat until smooth after each addition. There should be three additions of dry ingredients and two additions of the milk. 7. Divide cake batter evenly between the three cake pans and bake for 23-26 minutes, or until a toothpick inserted comes out with a few crumbs. 8. Remove cakes from oven and allow to cool for 3-5 minutes, then remove to a cooling rack to finish cooling. 9. While cakes cool, make the purees. You’ll make the strawberry puree mixture separately from the blueberry one and have more strawberry than blueberry. To puree the berries, add them separately to a food processor and pulse until smooth. 10. Add the water and sugar to the strawberry puree and stir until combined. Repeat with the blueberry puree. Set both aside. 13. To stack the cake, first remove the domes from the cakes with a large serrated knife. Then, use a small straw, or something similar, to poke holes in the top of each cake. 14. Place the first layer of cake on your cake plate. Spread half of the strawberry puree over the cake, so that it soaks into the holes. 15. Top cake with a layer of whipped cream. 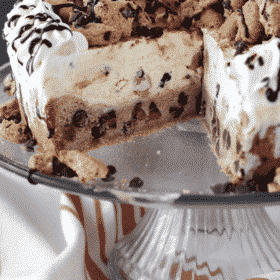 You’ll use about 2 cups of whipped cream per layer. 16. 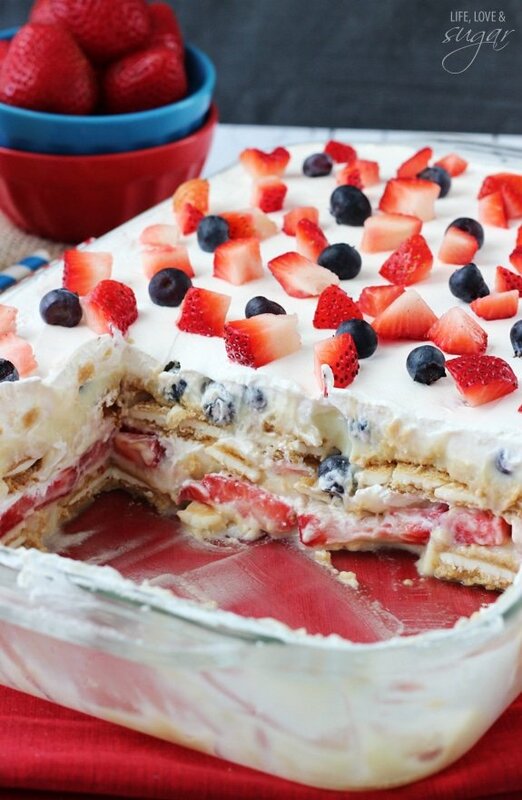 Top the whipped cream with blueberries and sliced strawberries. 17. 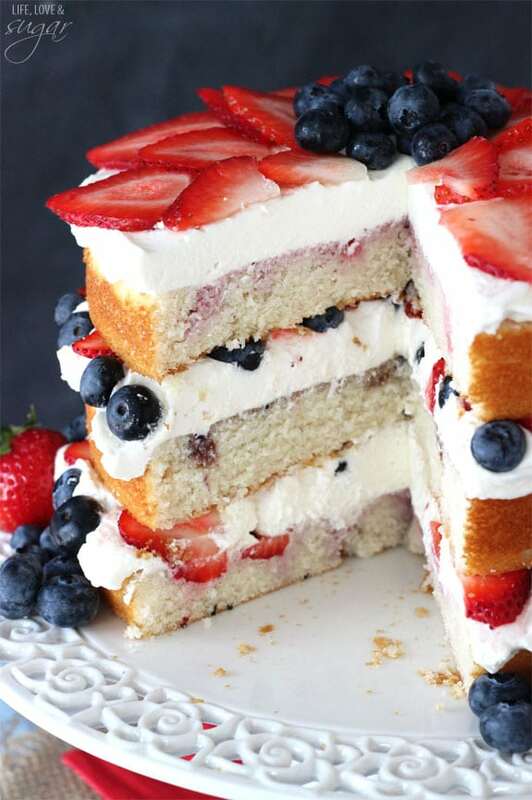 Repeat layers 14-16 with the second layer of cake using the blueberry puree, whipped cream and berries. 18. Top the cake with the last layer of cake, using the other half of the strawberry puree, then spread with remaining whipped cream. 19. Slice remaining strawberries for use on the top of the cake to make the flower. 20. To make the flower, place slices of strawberries around the top edge of the cake, allowing the bottoms of the “petals” to touch. Make three rows of slices, overlapping them. 21. Fill in the center of the flower with blueberries. 22. Refrigerate cake until ready to use. Best if eaten within 2 days of making. It’s July 4th perfection! 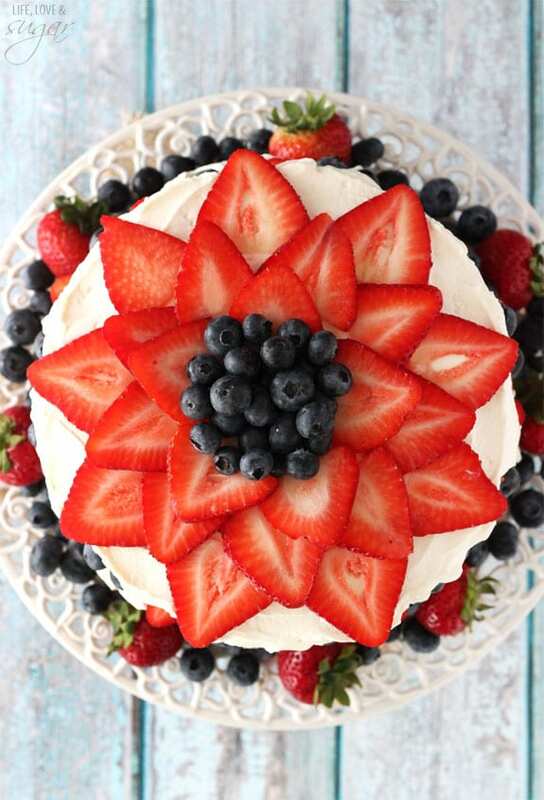 Love how the fresh berries act as all the decoration you need! This looks delicious! Not clear though when and how the purees are used. 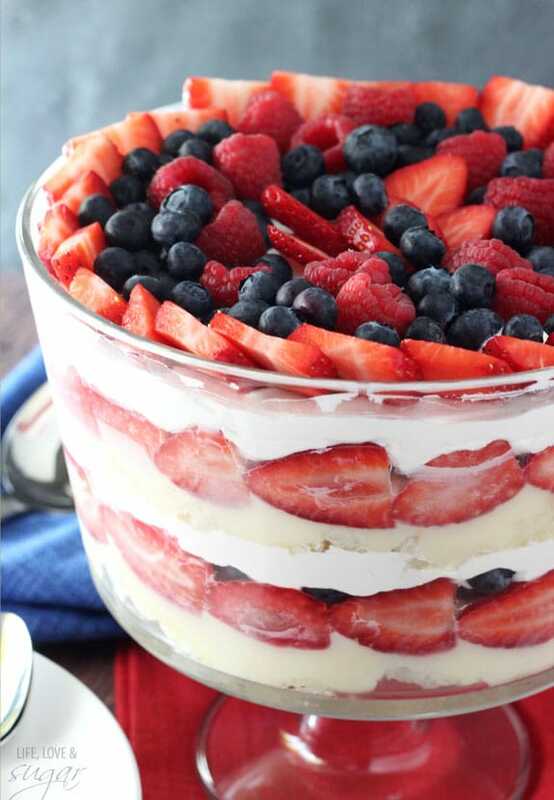 Please clarify so I can make this for July 4. Hi Lindsay. I love your site. I attempted my first try at your recipes this evening. We are celebrating our grandaughter’s first Birthday and I opted to make the cupcakes. I made the lemon blueberry and the fresh strawberry cupcakes. Unfortunately they did not turn out for me. I combined everything together and mixed it but my butter did not marry up too well with the rest of the ingredients resulting in my cupcake cups saturated with melted butter. Was I supposed to mix the butter with the sugar and then add the balance…..wet and the dry? Also, the blueberries did not sit on the bottom, they were throughout. Heeeelllppp! I love your recipes and I have many more to try, but I need to know where I went wrong. Thanks Lindsay! Hi Gina, I’m sorry you had trouble. It’s hard to diagnose a problem from afar, but you could try melting the butter before adding it to the batter to help get rid of the lumps. This is the perfect way to enjoy a cake in the summer time! So much beautiful fruit! What a gorgeous dessert. I just adore layer cakes! I never comment on blogs or recipes but this cake and the lemon cake was amazing and a huge hit with my boys and my family. I can’t wait for more from you. Thank you so much Holly! I’m so glad you enjoyed them both! This is gorgeous Lindsay!! I love Driscoll’s, the perfect berry! Hey Lindsay , love love your website!!!! You have a talent for making food look like an art piece , this cake is so beautiful it belongs in a art gallery. I would love to make this cake for my 23rd birthday, quick question for the purees can you use frozen and thawed fruit instead of fresh? Hi Courtney! Thank you! Yes I think frozen fruit would be fine. Just try to drain as much of the water from the frozen fruit as you can. Happy Birthday! Wow! Can I substitute plain yogurt for sour cream? And if I used unsalted butter, how much salt would I need to add to the cake? And when would I add it? You’d use 1/2 tsp of salt and add it in with the dry ingredients. Enjoy! I think people do that with success. I usually find that it alters the texture and moisture of cakes a bit, but you could try it. Just to clarify, does the blueberry purée have sugar, too? I wasn’t sure as directions say add blueberry purée and 1 tsp blueberries. Planning to make this for my moms birthday. Thank you! Gosh, I’m surprised nobody has pointed that out before! Yes, that should be sugar. I’ve updated it. Thank you! The cake strips could be the reason. Since not as much heat reaches the sides of the pan, they may not brown as much. Can you use Light sour cream? That should be fine. The lower fat content should be ok.
Hello there, I was looking through the directions of this cake recipe and was wondering what the height of the 8 inch pan is that you used for this cake. Hi there. Cake looks beautiful! I’m planning on making this for my son’s birthday. You think the whip cream and cake will hold up in the refrigerator over night? I would hate to make this the day before and have it flatten out overnight for the party. : Thank you!!! Yes it should hold up fine. Just be sure to use all the powdered sugar listed in the whipped cream. It’s a stabilizer for it. Can I use the cake in the triple berry trifle. You could try it. I find that angel food holds up better. The cake could get more soggy. But you could try it. 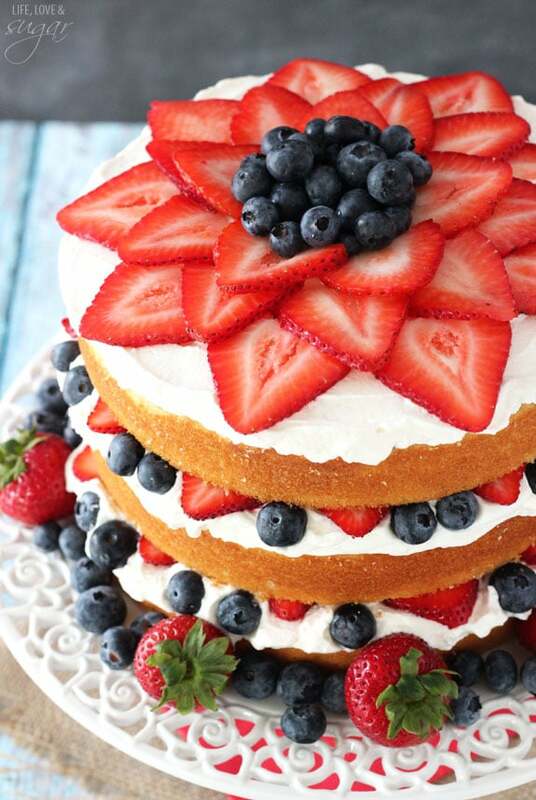 Hi I’m going to make this cake but instead of strawberries do u think blueberries raspberries and kiwi would work ? As long as you like the flavors, I think it’d be fine. When you say add egg whites in 2 batches, do you beat your eggs or do you mean 2 lots of 3? I mean add 3 egg whites at a time and mix after you add them. Hi! I love this recipe! I’ve made it a few times and it always comes out delicious. I would like to try making it into cupcakes…any special suggestions for that? Or just standard recipe and shorter bake time? So glad you’ve enjoyed it! Yep, pretty straight forward. I’d suggest trying 16-18 minutes on the cupcakes bake time. Beautiful cake! I just made the cake recipe, but haven’t assembled yet. My cakes turned out rather thin and seem dense…not thick and light like yours. Any ideas??? It can be really hard to say from a distance. I always say to be sure to fully cream the butter and sugar and be sure ingredients are measured correctly (I really prefer to weigh my dry ingredients). Hi, i was wondering if this cake is stable and wont dome in or start sliding? Not sure what you mean by “dome in”, but it shouldn’t slide as long as the cake isn’t moved around a ton. The whipped cream is stabilized with powdered sugar and will keep it’s form. Hi, I was wondering if this cake can be with 9-10 inch pan and how much extra ingredients would need to be added. Thank you!!!! A two layer 9 inch cake should be fine without any adjustments except maybe a few minutes here or there on the baking time. Not sure about a 10 inch. Hi! Yours’ looks delicious. Just made it, but each of the cakes are incredibly thin! Do you think you might have a typo on the amount of one of the ingredients? No, the ingredients are correct. It’s hard to say from afar what could have caused the problem, but often it’s not creaming the butter and sugar together fully. Just made this and it was sooo good! Got rave reviews. I doubled the whipped cream and covered the entire cake with it because I’m a whipped cream fiend. I also cut up some leftover strawberries to serve on the side for those who wanted more. I’m so glad you enjoyed! The strawberries sound like a nice touch! Love this cake. My husband made this for my birthday and it was awesome. Looking forward to the next post. This cake is SO GOOD. I love it. The only thing I do differently is change the amount of powdered sugar in the whipped cream to a scant cup because I like it less sweet. Still, this cake is one of my favorites. I think the cake itself is going to become my go-to white cake recipe to use even with different kinds of frosting. Thanks for the recipe! Will a cake like this keep in the refriderator? Or should it be served immediately? I have a recipe for a fruit cake as well and worried if I make it and don’t serve for a day that the berries will make the cake layers soggy.. Serving the cake fresh is probably best because of the berries, but you could maybe get away with making it the night before. 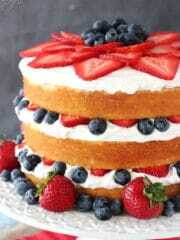 Is the recipe for the fresh berry vanilla layered cake in your cook book, Simply Beautiful Homemade Cakes? No, the cookbook is primarily made up of new recipes that are not on the blog.